Maybe I was exuding the confidence of someone about to appear on CNN, but I swear I felt magnetic. I was turning heads as I walked toward the Time Warner Center in New York City this morning. One man on the street called me “gorgeous.” (Okay, he was trying to sell me something, but I’ll take it.) 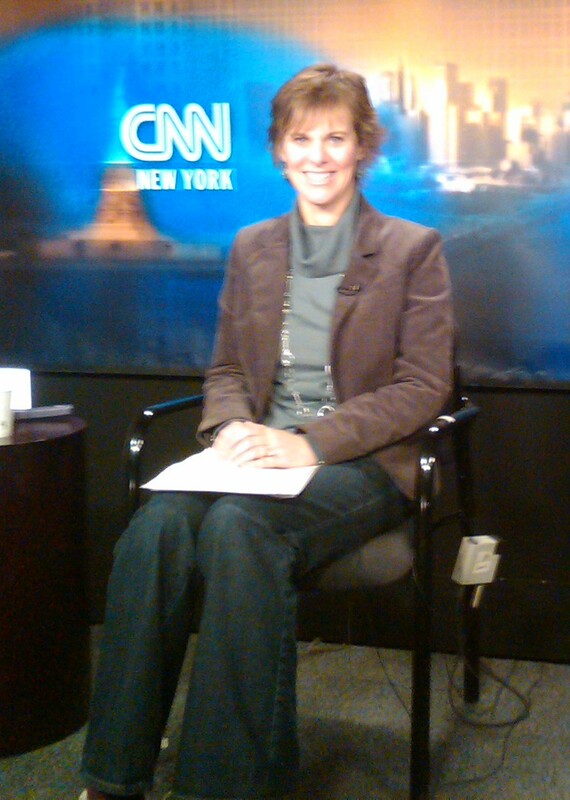 I felt like a rock star — and CNN has had actual rock stars traipse through their halls. I got through Security and headed upstairs where a nice woman named Nina got me settled on a set with a photo of the Statue of Liberty as the backdrop. I did the interview with producer extraordinaire Stephanie Oswald, grabbed my stuff, and continued to be my magnetic self all the way out the door and onto 58th Street. There, I decided that I deserved a treat at the Starbucks across the street for all my fabulousness of the day, and stepped into the street — jay-walking — during a brief break in the traffic. That’s when I remembered that I was not wearing slippers or Ugg-like boots, like I usually do, but fancy schmancy brown suede, high-heeled boots — boots that promptly clipped the uneven road and sent me hurling forward. I quickly gave up on attempting to right myself; I was too far gone at that point. Instead, my knees and my right wrist hit the pavement as a car braked in the street. I instinctively ducked into a roll, like all those years ago after being tripped on the soccer field, somehow managing to keep my purse balanced on my left arm. “Whoa!” I heard some men, who were loading things into a truck in front of the Starbucks, shout. “I’m okay!” I announced, coming out of the roll and onto my feet. I waved to the driver of the car as if to say, “Hey, thanks for not running me over as I took a dive into the street.” I looked back: No ice, anywhere, or else I’d mumble something about Mayor Bloomberg and street clearing to save face. This one was all me. “That was a spectacular roll!” a man in a puffy coat offered. “I am a stunt double for the Real Housewives of New Jersey,” I told him, before heading into Starbucks for that treat I now needed more than deserved. On my way back out, I carefully treaded 58th Street at the crosswalk, lest I end up covered in my venti green tea latte, and headed home. No one was looking at me anymore. I must have dropped my magnetism in the street during my most spectacular roll. Robin, well, you made me feel better. Good thing your chin broke your fall. Kristy, Yes! Slow motion. I had time to assure the men watching I was okay, wave to the car and keep things from falling out of my purse. And yet, the whole thing was maybe 30 seconds long. Argh! LOL… sorry to laugh. I’m just glad you’re okay so I can laugh in piece. Sounds like a great “save” as far as the roll and I’m glad you hadn’t gotten your treat yet. I can’t recall the last embarrassing thing I did, but I often SAY embarrassing things! Congrats on the interview. Holy stop, drop and roll! Nice move, on all counts, Momma! LOL! One more reason to love you!! I almost had to get stitches once from walking to my couch to my bed. I tripped on a throw blanket and broke my fall with my chin. Walking is hard. I fell in front of my work building one day. It felt like I was falling in slow motion. And of course, it was lunch time so I had a big audience.